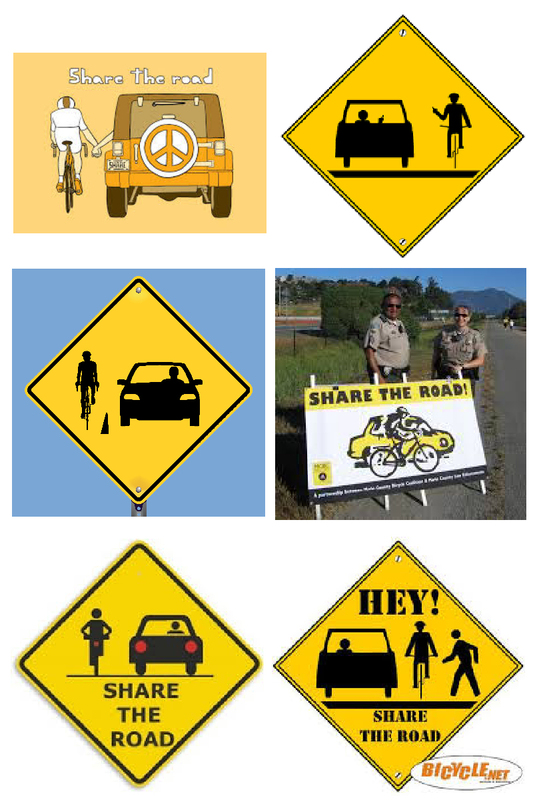 You’ve probably seen the “Share The Road” signs alongside streets and roads and probably didn’t give them much thought. But what do they mean? What do people think they mean? Do they have the intended effect? In New York State, you’ll see the diamond sign with just the bicycle and the “SHARE THE ROAD” message in a rectangular sign below it. Newer signs have the words “IN LANE” and the Share the Road signs are no longer used. Although nationally, the MUTCD provides a better sign, the white “BICYCLES MAY USE FULL LANE” sign, New York does not allow it’s use, fearing it may mislead inexperienced bicycle riders into using an inappropriate lane position. New York State is unable to fully commit to acknowledging cyclists as equal users of the road with cars! So, why has Share the Road fallen out of favor? Isn’t it good for cyclists? Well, actually not. At face value, you’d think it meant that motor vehicles should share the road with bicycles and move over and give them room. Unfortunately, to some people, it means the opposite. They (mostly motorists, but also some law enforcement officers) think it means that cyclists should move over and get out of the way for motor vehicles! The entitlement of some drivers boggles the mind, to think that there would be a need for a sign to further assert their dominance on the highway! To illustrate the way that the Share the Road misconception has infiltrated our driving culture, I’ve collected a few pictures that show cars and bikes squeezing by each other on the road. Some of these are from misguided cyclists or cycling groups. Others are from some government or community agency that thinks they are helping by educating the public incorrectly. One is even some Law Enforcement Agency. The one thing they have in common is that they all show sharing the road as a car and a bicycle occupying the road in the same place at the same time. It doesn’t take Neil DeGrassi Tyson to realize that this is dangerous and doesn’t work. 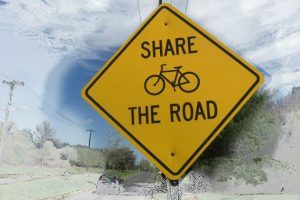 So, just what does sharing the road mean? Sharing the road is best understood as something you should have learned in Kindergarten: Taking Turns. Sharing the road means when a cyclist is using the lane, a car can’t, and vice-versa. It not sharing in physical dimensions, it’s sharing in time. It’s MY turn now, you wait your turn. The “BICYCLES MAY USE FULL LANE” sign is now preferred over the old signs. 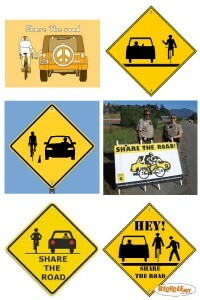 Along with Sharrows, it sends an accurate message to drivers. It’s easy to see why many motorists have a hard time understanding this. The car culture is based on speed and we’ve elevated driving to a mental race with everyone else on the road. How dare someone not drive at the speed limit (or 10mph over) and slow them down? And some cyclists are just as bad and buy into it as well. They ride in the gutter and on sidewalks, through crosswalks and are deathly afraid to use the roadway the way it is intended to be used. They are the ones crying for bike lanes. Everything mentioned in the last paragraph – gutter-riding, sidewalk-riding, riding in the crosswalk, and bike lanes, are more dangerous than actually riding in the road as a vehicle does. So how should a motor vehicle operator share the road with a cyclist? It’s really pretty simple: just imagine the cyclist is a small car driving slowly. Slow down. Wait for an opportunity to pass, and pass using a full lane change. This usually only takes a few seconds at most. If the cyclist is a confident rider and is riding in the middle of the lane, you should have seen them ahead sooner than if they were at the edge of the road and be able to anticipate passing. On two lane roads, you need to be careful of oncoming traffic. On multi-lane roads, simply change lanes. If traffic is so heavy that passing a cyclist is difficult, you are probably not moving that fast anyway. The infographic to the left shows, in the top half, a bicycle and a pickup truck attempting to share a 12 ft. lane, side-by-side. It’s a pretty uncomfortable situation, but drivers, law enforcement, and even many cyclists continue to think it is the norm. It’s no wonder cyclists get clipped by mirrors, or run over at right turns. 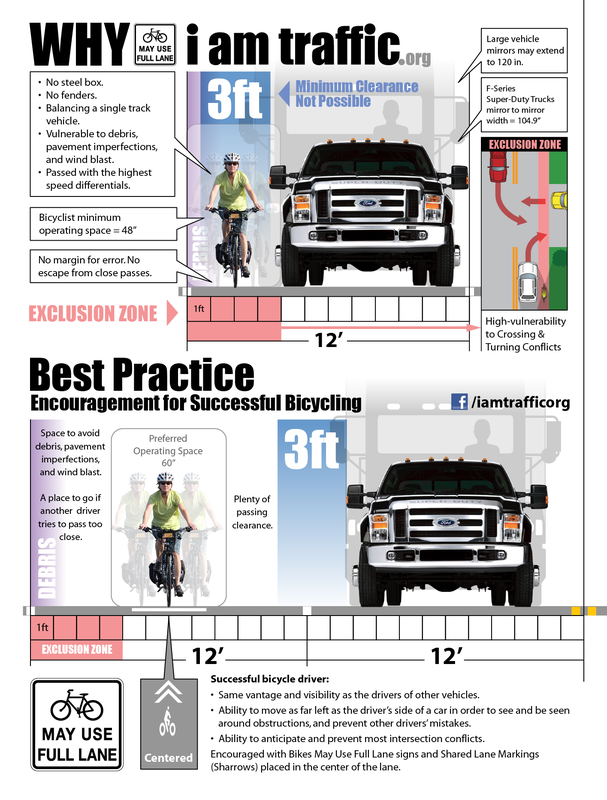 The bottom half shows the best practice situation, where the cyclist rides in the center of the lane, taking up enough space to be safe and let other drivers know they should change lanes to pass them safely. So, please share the road, I’ll take my turn now.